Storage can be beautiful as well as functional, as shown by the charming fretwork and remarkable nickel hardware on this display bookcase. This piece offers two, full-extension file drawers and removable storage trays for smaller office supplies. The top drawer is lockable to protect your sensitive or valuable papers. To add more flexible storage to your work space, a bookshelf hutch with adjustable glass shelving and display lighting is included. Truly and example of creative storage for the modern home. The Greystone Octavia File Chest and Deck with Lockable File Storage and LED Display Lighting by Sligh at AHFA in the area. Product availability may vary. Contact us for the most current availability on this product. 250-450 Octavia File Chest 1 47.5" 22.5" 34.5"
250-441 Octavia Deck 1 47.5" 14.25" 54"
Storage 2 full extension file drawers accommodate legal/letter size files, removable storage tray in each drawer. Locking top drawer. Description: Top Desks feature gray, faux leather writing surfaces. 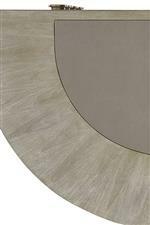 Greystone is a fresh way to incorporate elegance and fashion into your work space. Nothing is more motivating and inspiring than a workspace you love, and the Greystone collection is sure to be love at first sight. This remarkable look stars a calming, weathered gray finish that ventures into the glam domain with enticing fretwork patterns and bright nickel hardware. The collection adds much-needed functionality to your home office with flexible storage, display shelving, and easy cord access for your electronics. The Greystone collection is a great option if you are looking for Transitional Contemporary furniture in the area. Browse other items in the Greystone collection from AHFA in the area.